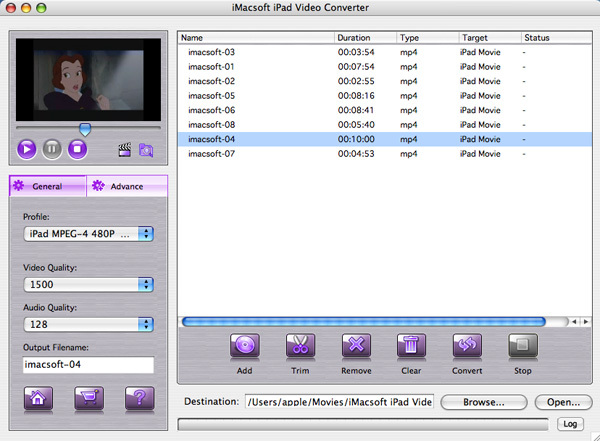 iMacsoft iPad Video Converter for Mac, the excellent video to iPad converting software, can convert video to iPad and audio to iPad library, such as AVI, MPEG, WMV, DivX, XviD, RMVB, RM, FLV, SWF, MKV, 3GP, MOV, M4V, VOB, MP3, AAC, AC3, etc. And iPad supports video and audio formats, including MPEG-4, H.264/MPEG-4 AVC, AAC, MP3, and M4A fast and easily. In order to appreciate your newest iPad, iMacsoft iPad Video Converter for Mac is the optimum video and audio conversion tool for iPad users. This versatile software offers many editing features: trim files and adjust codec, bit rate, and frame rate. These settings are available at your fingertips for customizing the videos. Besides all the output files supported by iPad, these files can also be played well on other portable devices, such as iPod classic, iPod touch, iPod touch 4, iPod nano, iPod nano 5G, iPod nano 6G, iPod shuffle, iPod shuffle 6G, iPhone 3, iPhone 4, iPhone 5, iPhone 5S/5C, iPhone 6/6 Plus. With this best Mac iPad Video Converter, you now just need a few steps to enjoy all kinds of audio and video files on iPad in your spare time. Don't hesitate, download this software and have a trial right now!